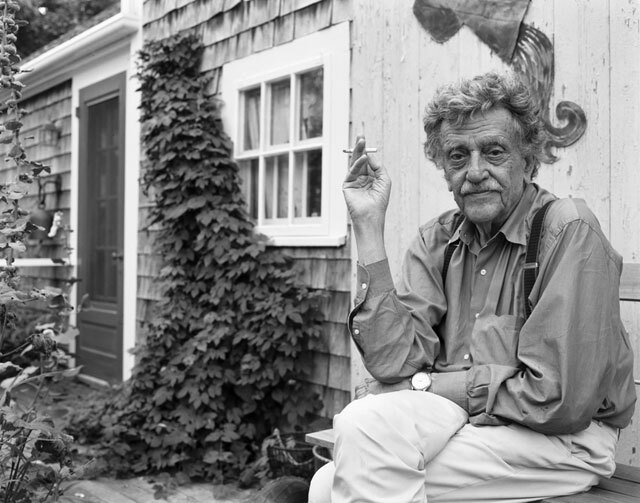 Kurt Vonnegut wrote at length in many books and essays about his writing process. He would sit at his Smith-Corona typewriter, smoking Pall Malls like a chimney. It was easy for me to imagine myself just like him. It was so easy that every time I sit at my typewriter I yearn for a cigarette. It's a powerful thing, reading about people who seem like you, doing the thing you want to do. Sometimes, I'll be writing in my coffee shop at my computer, feeling that I'm not doing real writing because I'm not shaving a pencil into the saucer of my coffee cup, agonizing over the structure of every sentence and placement of every word. I want every word to be honest and true, and my writing to be clear. It should be torture. I'm not Hemingway, but reading him talk about writing, it puts an idea in my head of what writing should look like. Every time I'm facing an open window, looking out over the mountains of Salt Lake City, I imagine the setup Stephen King has talked about in his writing process in his office, staring out at the landscape. Every time I fell in love, I wondered how it would look in a story that Graham Green might write. Would it ever be as good as The End of the Affair? When I stand in front of an audience, I can easily see the world through Mark Twain's eyes, thinking about what it's like to work a crowd with nothing more than my ability as a raconteur. In movies, I think of people who have played writers and when I was still pretending to be a writer, I'd take cues from them. James Caan. Johnny Depp. Woody Allen. Nicolas Cage as Charlie Kaufman. Joseph Fiennes. Joseph Cotton. William Holden. John Turturro. Owen Wilson. Robert Redford. Dustin Hoffman. Even Jack Nicholson. I have more role models than I know what to do with, both in reality and in fiction. They're all generally straight white men. I think a lot about this. What made me think that being a writer was possible? What made me think it was something worth pursuing? What made me think that it was socially acceptable? This is part of the privilege I've had in my upbringing. Because everywhere I turned, someone who looked like me and had a background like mine and went through a turbulent childhood like I had, was easily seen doing the thing I wanted to do. It wasn't limited to writing. It was filmmaking, too. Or being a superhero. Or a police officer. Or a lawyer. Or firefighter. Pretty much anything I wanted to do, there was a rich history of examples for me to emulate going back as far as you could imagine. Women are catching up in this regard but still haven't reached anything close to parity. It's even worse for people of color. How can we close this gap and give others more role models, both real and fictional? Not just to be a writer, but to be anything? This is part of why I've tried to spend the last couple of years reading authors who don't look or sound like me. And it's why I've been trying to write books that don't feature lead characters that look or sound like me. I want to do my small part to give others who aren't like me the chance to feel like they could be the lead of the story rather than the plucky sidekick or token character. But it's not my job alone. We need many more people of much more diverse backgrounds to write about people who look and sound like them, too. So the next generation of writers isn't so homogenous. And, with luck and hard work, the generation beyond that won't even know what we're talking about. If this sounds like you, trust that I'll help in any way I can. Just let me know if there's a way. I'm doing what I think I can, but maybe I'm doing the wrong thing. As for my writing, I've been very busy. I wrote a piece about The Seventh Seal for my Cinema Behind Star Wars column for Starwars.com. It's a wonderful film and has more ties to the Star Wars universe than you would possibly guess. I also did two pieces for HowStuffWorks, the first is on the films of 1986 and the other is the next in my Ridiculous History series. This one is about how Oregon was "whites-only" until 1926. It was one of the more difficult pieces I've ever had to write.